As the capital of the federal state of Saxony, Dresden is one of the most popular destinations in the region. 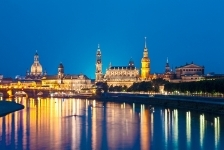 Dresden city offers the famous and impressive sights of the Frauenkirche church and the Zwinger Palace, as well as opportunities for unforgettable adventures into the city, or beyond its boundaries. Enjoy a bike-tour and experience the city on two wheels, or take a drive out into the countryside surrounding the city. Dresden is famous for its Baroque architecture, which can be found throughout the city. Take a pleasant stroll or a city tour and see the restored Frauenkirche, a church with one of the largest domes in Europe, the Old Market and many other famous sights. During the winter, the Dresden Christmas Market extends into the city, and as one of the famous German Christmas markets, is definitely worth a visit. 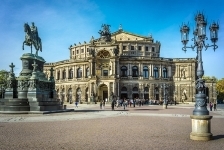 Other popular and famous tourist attractions to visit in Dresden include the Semper Opera House and the Brühl'sche terrace, which has been nicknamed the "Balcony of Europe". The terrace offers a breath-taking stroll along the River Elbe. Enjoy an excursion to Dresden, which was a declared a World Heritage Site by UNESCO in the years 2004 to 2009. The city offers around 13,000 cultural monuments and eight Conservation Areas, which are exciting and interesting destinations. Meanwhile, the Heritage Open Day offers year round events, exhibitions and publication about the city's monuments, where you can learn about and discover the history of the city. Dresden is also called the "Florence on the Elbe", both because of its wide art collections and due to its beautiful baroque architecture and scenic location on the Elbe. Dresden tourism can cater to visitors of all ages, and a popular destination for visiting families is the zoo. Dresden Zoo was built in the 19th century and has been continually developed, improved and filled with more species. Children can also enjoy an exciting paddle steamer trip along the Elbe, and the old ships are still well preserved and lovingly maintained. The capital of Saxony offers its residents and tourists numerous recreational activities and there are all kinds of things to do in Dresden. This is how you can enjoy Dresden tourist attractions with Regiondo. Tourism in Dresden doesn't need to stop at the city limits, and visitors can find plenty to do and see in the surrounding region. This includes the impressive Rammenau Castle, which can be viewed from the inside. A hike to the ruins of Frauenstein takes visitors into the past, giving them the chance to see the still impressive castle ruins. In Pirna, the German Democratic Republic Museum gives visitors to learn about Germany's past. Königstein is a popular destination for those with children, where they can enjoy sports or rides through the area, or go to the adventure park Moritzburg. Even more excursions in and around Dresden can be found on Regiondo.